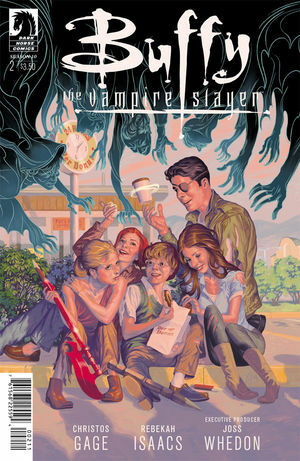 The relaunched Buffy the Vampire Slayer comic series continues to keep my interest by doing fresh, interesting things with characters that feel, sound, and look right. Season 10 is setting itself apart by once again mutating the traditional enemy vampires, but instead of making them oh-so-trendy zombies, now, they’re throwbacks. With the ability to transform into beasts — humanoid bats, wolves, insects, and so on — they’re shaking up our heroes and preventing them from being too jaded. They’re more powerful (particularly when you add in the not-yet-explained ability to operate in sunlight) and more of a challenge at the same time they’ve become more traditional. Writer Christos Gage does an excellent job evoking past events in a way that readers are reminded of the characters’ long (and sometimes convoluted) history, not confused by it. They wisecrack the way they used to, and they care, too, with a depth justified by the long-running property (and the emotions of the fandom). I’m not put off by the fight scenes here. I know they’re necessary, but sometimes they feel like killing time and page count. That’s not the case now, as they allow space for more dialog, just like the original. Rebekah Isaacs’s art makes the characters visually expressive as well. The bad guy so far is a former slayer now turned vampire, a new twist on the traditional enemies that’s even more twisted than having two of them love each other. That’s a side effect of magic restarting, a device that allows for new surprises. Meanwhile, teen Giles is navigating his new position (and new physicality) with the gang. Gage’s work has an innate optimism I find refreshing and enjoyable, as even when they face difficult struggles, this team knows they can rely on each other. I particularly liked how cheerful the police detective Buffy dated was. She wanted to be angsty, but his attitude seemed much less melodramatic, more human and mature. That faith in each other gets the group into trouble in issue #3, as they decide to send the worst person possible to fetch Dracula for help with this new breed of vampire. 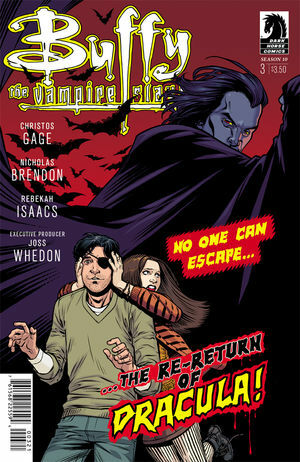 Nicholas Brendon, who played Xander on the show, joins as co-writer with this issue, which explains the focus on his character. There’s more dialogue than usual (which is pretty impressive) as Dracula baits the youngsters and takes a “heel turn”, as Andrew puts it. On the personal side, Xander and Dawn are trying to navigate their relationship. I had no idea I’d be this interested in these characters again after all this time. (The show debuted 17 years ago.) I’m glad this is such an enjoyable translation of the franchise.